A new trailer from Nintendo showed a game that looks like it takes place in the world of Mario & Luigi games, with little sprite characters, one that has been visited by a flat Mario made out of paper. The M&L role-playing games have usually let players control both of the famous Nintendo brothers at once both while roaming the game’s overworld and while facing off against enemies in turn-based battles. 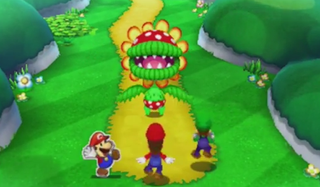 This new game appears to add Paper Mario in as a third controllable character, using his paper properties for additional navigation and combat options. The colorful trailer for the game also showed off what looked like a free-roaming battle mode that involves little Toad characters carrying around and battling with massive papercraft Mario-universe figures. It’s always been a bit odd that Nintendo has two ongoing Super Mario role-playing series. It’s odder still, yet pretty cool, that they are crossing them over. We’re not sure who is making the game, whether it’s the Paper Mario team at Intelligent Systems of the M&L crew at Alphadream. We’re checking with Nintendo.